You are here: Home / Bay Area Hiking and Backpacking Trails / Hike North Peak Montara Mountain: Stunning Bay Area Vista! 360-degree view! Hike to the summit of North Peak Montara Mountain via North Peak Access Road from Montara State Beach through McNee Ranch State Park and you’ll win a superb panorama of the San Francisco Bay Area and the Pacific Ocean, including the Farallon Islands. You’ll also see an impressive array of wildflowers and chaparral plants along the trail. Notes: Dogs allowed on-leash. Toilet near trailhead. The trailhead for North Peak Access Road, the trail that leads to the summit of North Peak Montara Mountain, is on the east side of CA Highway 1 about a half mile north of Montara, 8 miles north of Half Moon Bay, 0.7 mile south of Gray Whale Cove State Beach, and 6 miles south of Pacifica. It’s near an entrance gate with a sign for McNee Ranch State Park. If the small lot is full, look for lots just to the north and south along the west side of the highway near Montara State Beach. Hiking trail map of Montara Mountain, with North Peak, other nearby peaks, and Montara State Beach. in the fourth edition of my guidebook 100 Classic Hikes: Northern California. The all-color book has 21 trails in the San Francisco Bay Area (including Briones Peak in Briones Regional Park), with the remaining 79 trails exploring the Northern Sierra Nevada, Lassen Volcanic National Park, the Mount Shasta area, the Klamath Mountains, the redwood coast, and the Wine Country. You’ll pass numerous side trails as you climb briskly on North Peak Access Road, including the Gray Whale Cove Trail and other trails that lead to it; these are also popular with hikers, so you may see people joining you from those trails. Note, though, that you stay on the main North Peak Access Road the whole way, so ignore all of these other paths, or explore them on the way down from the summit. North Peak Access Road initially travels east and parallels a grove of tall cypress trees, with Martini Creek just to the right. 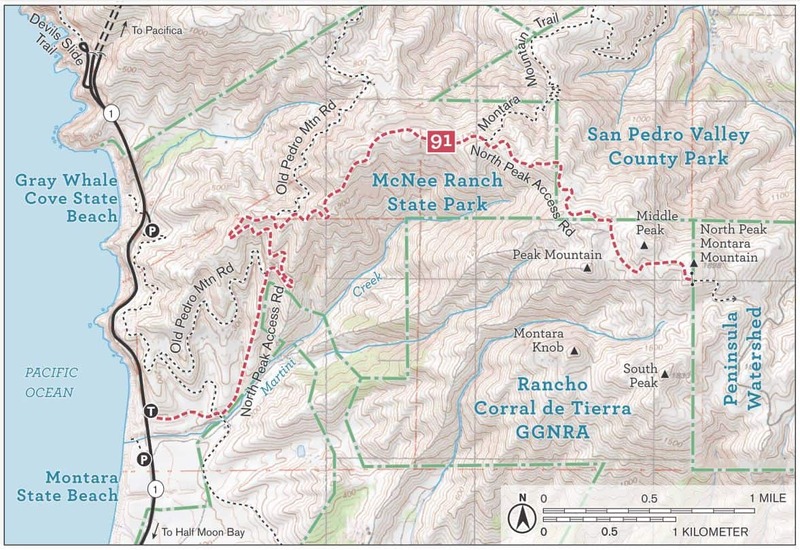 Reach the ranger residence for McNee Ranch State Park and Montara State Beach at 0.2 mile. Shortly thereafter the route turns sharply north to rise through occasional pine groves. Steep climbing begins around 1.0 mile, accompanied by California poppy and lupine, as North Peak Access Road makes broad switchbacks. Blue-blossom California lilac dominates trailside farther along as monumental rock outcrops attract attention in the distance. North Peak Access Road then makes a long arc that begins northeast, and then east, and then southeast. You may be tempted to stray off the route to climb a number of small peaks beyond 3.0 miles, but stay on the main dirt road and reward yourself with a 360-degree view from the microwave and weather station atop 1898-foot North Peak Montara Mountain at 3.8 miles. Look for Mount Diablo to the east and Scarpers Peak and the Santa Cruz Mountains to the southeast. Half Moon Bay and its neighboring beaches stretch below to the southwest, and mighty Mount Tamalpais hovers to the north above the San Francisco skyscrapers. To the west, beyond the coastline, stretches the vast blue of the Pacific Ocean, and the Farallon Islands are visible on exceptionally clear days. Finish off your excursion by exploring Montara State Beach, which is just across Highway 1 from the trailhead. Walk the sand and, if the tide is low enough, explore tide pools. Your dog is welcome on a leash. 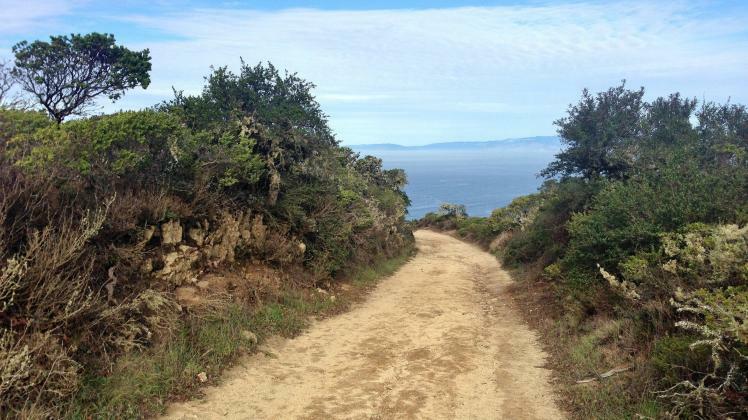 Have you hiked North Peak Access Road to the summit of North Peak Montara Mountain? What did you think? Any questions about the hike or trail conditions? 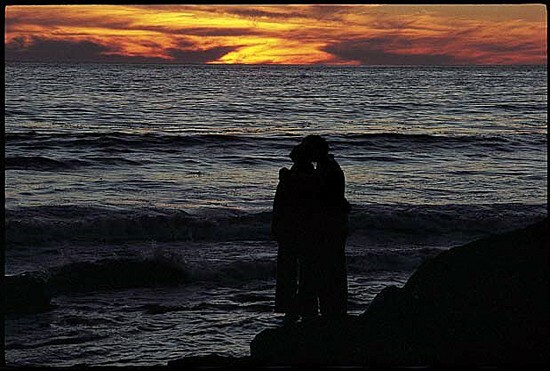 And have you been to Montara State Beach?